The main objective of this report is to analysis Bangladesh Economy and Vision 2050. Other objectives of this reports are to identify the existing problems and governance failure have caused to severe problem in economy, to identify the vulnerable areas of problems and risks as at policy level, procurement, generation, transmission, distribution of resources of economy, to identify the factors responsible for poor HRM, accountability and transparency of resource distribution, to identify the reasons for non-technical loss and estimate economic loss, to provide policy guidelines finally and Detailed study of each of the strategies and show how it is useful for the economic growth for Bangladesh. Detailed study of each of the strategies and show how it is useful for the economic growth for Bangladesh. The steady, stable growth performance of Bangladesh over years amid repeated episodes of natural calamities and external shocks has provided markets and entrepreneurs a predictable policy environment of low uncertainty. Following a couple of years in global crisis related mild slowdown, economic activities have rebounded in fiscal year (FY) 11 with strong (above 40 per cent) growth in both exports and imports. Provisional Bangladesh Bureau of Statistics (BBS) estimate reports 6.7 per cent real GDP growth for FY 11 (July 10-June11), following 5.7 and 6.1 per cent respectively of FY 09 & FY 10. The severe power supply shortages impeding output activities eased significantly in FY 11, enabling utilization of idle installed capacities. Benign climate and timely support measures yielded good growth in agricultural output. Given the palpable pace in growth momentum, the final estimate for FY 11 real GDP growth may touch 7.0 per cent; and the growth rate is projected to rise to 8.0 per cent per annum (pa) by FY 15. Growth path of per capita gross national income or GNI (estimated at USD 818 for FY 11) is on course to reach the middle income country group threshold (USD 996) by FY 15 or earlier. Bangladesh has approximately 160 million people, making it the seventh-largest population in the world. It is a densely-populated country (> 1,000 people per km2), with a land mass roughly the size of the state of Iowa. Over the past 10 years, Bangladesh has made considerable progress to curb population growth: the average Bangladeshi woman now bears fewer than three children in her lifetime, down from more than six in the 1970s. Nonetheless, projections forecast more than 50% growth in Bangladesh’s population, to approximately 250 million over the next four decades. This poses massive challenges for the government in terms of employment and the delivery of social services. Further, between 20-30% of the country is normally flooded each year and the country suffers from frequent natural disasters. Dhaka City is poised to become fastest growing megacity by 2025. It began with a manageable population of 2.2 million in 1975 which reached 12.3 million in 2000. There is no city in the world that has experienced such a high growth rate in population during this period. Due to the current growth rate of 2.7, Dhaka will be 4th on the list of world’s megacities. This rapid growth of Dhaka City is not commensurate with its industrial development, with about one-third of the city’s population living in slums. More than 45% of the population lives in abject poverty and 35 million live in extreme poverty. Bangladesh ranks 67th out of 84 countries in the Global Hunger Index 2009 and over 10 million children under the age of 5 suffer from malnutrition, which contributes to two in three child deaths. A weak public health system hampers delivery of care. The maternal mortality rate is one of the highest in the region but recently witnessed a 40% decrease to 194 deaths per 100,000 live births. Forty-nine percent of children under 5 and forty-six percent of women are anemic. Inequalities and challenges for women and girls are not adequately addressed, and improvement in this area is especially important given their role as gatekeepers of the country’s social capital. Further, Tuberculosis is still the major cause of adult mortality as Bangladesh has the fifth highest level of TB cases in the world. Fortunately, HIV/AIDS is well below 1% and our efforts will focus on maintaining that level. We envision a democratic system where people choose their government freely and get services from it without hassle, enjoy freedom from fear and intolerance, live with dignity; where every citizen is assured of social justice, environmental protection, human rights and equal opportunities; and where the rule of law and good governance flourish. We envision a liberal, progressive and democratic welfare State. Simultaneously we envision a Bangladesh which by 2, will be a middle income country where poverty will be drastically reduced where, our citizens will be able to meet every basic need and where development will be on fast track, with ever-increasing rates of inclusive growth. A vigilant and active civil society. Higher foreign exchange earnings from the export of semi-skilled and skilled labor. Concentrated & coordinated efforts by Govt. Bangladesh will have enhanced productivity based on modern technology, diversified types of agricultural outputs, & commercialized agricultural produce. The economy of Bangladesh is primarily dependent on agriculture about 84 percent of the total population live in rural areas and is directly or indirectly engaged in a wide range of agricultural activities. Agriculture sector is the single largest contributor to GDP. Crop production system is highly labour intensive and there is an abundance of labour supply in the country. Agriculture is the largest source of employment for skilled and unskilled labour. Favorable natural environment generally exists throughout the year for crop production. Wide range of bio-diversity exists for different crops. Agriculture is dependent on the vagaries of nature and is risky. Availability of cultivable land is decreasing. Lack of required capital for agricultural activities. Inadequacy of appropriate technology considering farmers’ socio-economic conditions. Uncertainty of fair price of agricultural due to underdeveloped marketing system. Overcoming the shortage of working. Democracy and strong democratic institutions will be established for holding reliable election at regular intervals, accountability of government and effective Parliament. All necessary steps will be taken for making Parliament effective. Local government will be given due importance with a view to effecting radical change of the political system. The local government institutions will play a critical role in development programmes. Self-reliant local self-government institutions will be established at upazila and zila levels to ensure representative, responsive and functional governance at the grassroots levels. Human rights will be established on a strong footing with a view to ensuring the rule of law. Independence of the judiciary will be ensured and the institutions of the state and administration will be freed from partisan influence. The basis of appointments and promotions will be merit, efficiency, seniority, honesty and loyalty to the Republic; political connections will have no relevance. Terrorism, corruption and use of religion for politics will be eliminated. Steps appropriate to the time will be taken to establish democratic principles in the political parties, transparency of political funding, civility and tolerance. The institutions of the State will be made more effective along with an independent and strong Anti-corruption Commission for curbing corruption. Social resistance to corruption will be promoted along side legal steps. All possible steps will be taken to stop corruption, such as charter of citizens’ rights, right to information, computerization of official documents, and decentralization of power. Adequate checks at every level of public spending would be built into the financial management system of the government. The Women’s Policy of 1997 will be revived for ensuring equal right and access for women to the state and social space; laws which discriminate against women will be amended and 100 seats will be reserved for women for direct election. a. Meeting basic needs: With a view to providing food, clothing, shelter, education and health care to the citizens in accordance with Article 15 of the Constitution, gross domestic product will be raised to 8% by 2013 and 18-20% by 2050 which will be sustained thereafter. b. Population and labour force: Population in 2050 is estimated at 195m, and labour force at 135m. Programmes will be taken up for employment of at least 90% of the work force. c. Alleviation of poverty: We aim not at reduction of poverty, but removal of poverty, through which we shall try to achieve the Millennium Goals declared by UN by 2015, and by 2017 latest. Beginning in 2050, poverty will be reduced to 5% from 45% now, progressively. Number of poor people will rise from 45 million now to 65m in 2021, and then fall to 25m in 2021. Sustainable safety nets will be established for the extreme poor until poverty is removed. d. Food & nutrition: Food deficiency will be removed and self-reliance in food production achieved by 2012, which will enable us to meet the nutrition needs of 85% of the population. e. Health care: By 2050, a minimum daily intake of 2,122 kilo calories of food, elimination of contagious disease, primary health care and sanitation for all will be ensured. Average longevity will be increased to seventy years, and efforts will be made for the reduction of child and maternal mortality. f. Education: Enrolment at the primary level will be increased to 100% net by 2010. Elimination of illiteracy by 2014, improvement in the quality of education, creation of a generation educated in science and technology, graduation degree level education made free by 2013 and ensuring higher salary for teachers are the other educational goals. g. Industry: A strong foundation for industrialization will be established by 2050. Contribution of the industrial sector to national GDP will be doubled. Primacy will be given to agro and labour intensive industries and the highest emphasis will be given to the information technology sector. The investment policy will be geared to implementing a strategy for attracting both domestic and foreign investment. h. Energy security: An energy policy will be adopted tapping all sources of traditional and non-traditional energy to ensure an accelerated rate of economic development and industrialization. A three year crash programme will be taken up to meet the existing crisis. By 2015, electricity production will be increased to 8,000 megawatt. By 2050, demand for electricity is projected to increase to 35,000 megawatt. We will take all possible actions aiming at enhancing our generation capacity. To increase gas production, regular survey of gas resources and work on well development will be undertaken. To meet energy demand, efforts will be undertaken for regional energy security through mutual cooperation in addition to exploring internal sources. i. Infrastructural development: Road, rail, river and air transport and telecommunication systems will be expanded. Construction of bridges and tunnels for Padma and Karnaphuli rivers, connecting Bangladesh with the Asian highway and Asian railway, improvement of port facilities, building of a deep sea port to open up Bangladesh’s ports to countries of Asia will be implemented. In Dhaka, construction of a metro tunnel, elevated rail and circular rail to remove traffic jams and to solve public transport problems will be studied forthwith in order to undertake a feasible project. The project will then be implemented on a priority basis. j. Housing: By 2015, housing for all will be ensured. In every union and upazila, ‘growth center’ centric village housing and in towns housing with modern amenities will be implemented. k. Environment: All measures will be taken to protect Bangladesh, including planned migration abroad, from the adverse effects of climate change and global warming. Facing natural calamities, planned reduction of air pollution, prevention of industry and transport related air pollution and disposal of waste in scientific manner will be ensured. Steps will be taken to make Bangladesh an ecologically attractive place through retention of forests and water bodies and prevention of river erosion. l. Water resources: Bangladesh Awami League will take the initiative to formulate a comprehensive regional water policy along with India, Nepal and Bhutan for regional water security. In addition, in keeping with a comprehensive water policy, articulated earlier by Bangladesh Awami League, measures will be taken for development of our water resources and their rational use. a. Achievements of liberation: Multi-pronged measures will be taken to uphold the glorious history and the fruits of our national independence and liberation, to energize the new generation with the spirit of liberation, struggle, patriotism and love for humanity. Highest priority will be given to the development of an innovative spirit in the younger generations and opportunity will be provided for them to participate in nation building activities. b. Culture: Measures will be taken to remove obstacles in the development of Bengali culture, literature, art, music and sport and to provide all opportunities by the state to enable the younger generations to attain international standards and to contribute to the nation. c. Foreign policy: In international affairs Bangladesh will follow the policy of ‘friendship towards all and malice towards none’. Introducing technical education and skill development training. Creating job facilities for all. Facilitating vast migration as skilled manpower to Europe and Middle Eastern countries. Developing awareness for family planning and ensuring medication for all in order to ensure good standard of national health. Ensuring social justice and democracy. Population Growth. The population growth (1.47% as per Census 2001) has to be kept controlled within the capacity of national economy so that the later can support the development of ‘Human Resource’. Establish strong intelligence network throughout the country to monitor the terrorists. Ensure adequate protection for any diplomat and political gatherings. Ensure arrest of leaders of any terror organization. Strong vigilance along the border to prevent infiltration and exfiltration of any terror group. Ensure recovery of all illegal weapons. Effective check of arms smuggling. Finding out suspects of all bomb attacks. Ensuring exemplary punishment for terrorists and illegal arms holders. Seek international support where necessary. Raising people’s awareness against terrorism through media propagation. Countering terrorism and separatist movement in CHT. Introduce practical oriented education system which will facilitate employment just after passing out. Introduce massive 5 year program to train the unskilled youths in any skillful subject. Introduce law for banning import of items which are easily produced within the country, such as gems clip, blade, steel lock, bye- cycle tyre/ tube, ball pen etc. Undertake short-term and long-term policies to establish small and large industries for production of common commodities. Agricultural and communication sector’s machines should be produced within the country which will have a large market within the country itself. Reduce import gradually. Facilitate training and higher education at home and abroad for students at a large scale. Encourage self-employment business by providing loan with min tax and other support required. International organizations can be invited to train our youths by establishing various training institutes. Private entrepreneurs can be encouraged for establishing various training institutes and industries. .Conduct survey all over Bangladesh to identify feasibility for establishing cottage, small and large industries. Identify weaknesses and measures to control the corruption at all levels. Ensure strict law and punishment for bribe takers, human traffickers, smugglers, illegal stockholders etc. Introduce moral education in all institutions. Assign responsibility for each sector to control corruption within particular period. Massive industrialization in small and large scale industries sectors, thus ensuring massive employment. Ensuring free education not only for girls but also for poor boys. Introducing technical education in both traditional schools and madrasas. Arranging foreign employment and facilitating large scale migration for skilled workers. Steps to be taken for national unity by the ruling alliance and opposition parties. Opposition parties’ participation to be included in nation building programs. Strike should be band unanimously. Law and Order Maintenance Committee should be formed at each Upa-zila level by combining both ruling and opposition party leaders who will identify criminals and ensure action by law and order authority. Muscle power and use of excessive money should be restricted in election. Terrorists should not be sheltered by any party. Remain vigilant and firm to prevent such occurrence. Propagate religious tolerance and peaceful coexistence through media. Arranging practical education for respective professionals who are aged such as farmers, fishermen, poultry farmers etc. Effecting law for ensuring attendance of children in schools. Introducing penalty for not sending house workers to school. Some Child labor-watch-dogs should be employed for checking this. Introducing Education Loan from banks for any student who applies. Introducing an ‘age-limit’ for employment in any household or outside work. Introduce a ‘minimum wage’ rate for any worker in any job. Introduce ‘maximum time limit’ for work and ‘over-time’ system for their extra time labour. Ensuring economic emancipation of common mass. Ensuring severe penalty for traffickers. Ensuring border control for illegal trace pass. Arranging proper rehabilitation of victims. Taking support of neighboring and destination countries. Taking assistance of UN body. Pass and implement harder law against for such act of inhumanity. Raise social consciousness against such torture. Introduce awareness through academic syllabus at school , college and university level. Cast of Dowry. Every year hundreds of women are to face torture and divorce or even murder for the demand of dowry. Raise of social hatred and punishment can be introduced against such demand. Equal facility for education and employment. Equal wage rate and social-treatment should be ensured. Raise awareness through media and education system. Introducing academic and disciplinary systems so that no student gets chance to get involved in student politics. Ensure ousting of outsiders from student campus and halls. Ensure strong surveillance to detect illegal arms and take drastic measures against terrorists. Establish minimum one university in every district and reduce student numbers in each university. Ban all types of political gathering and procession within and near university area. Facilitate establishment of private universities and develop their standard. Facilitate large number of students’ admission in developed countries. Introduce ‘last age limit’ for students to continue study in universities so that no student can remain in university more than years required for Honours and Masters Degree at a stretch. Introduce strong disciplinary measures for students staying in different halls such as morning and evening roll call, in-out checking, compulsory study and rest period, restriction on guests etc. Maintain a sizable force compatible to any potential invader. Possess modern armament (with effective anti-Tank and anti-aircraft defense system ) and equipment to effectively deter any aggressor. Maintain adequate number of troops to counter any internal separatist movement like Chakma Tribal’s insurgency in Chittagong Hill Tracts (CHT). Introduce practical oriented subjects which will be helpful for the student’s employment. Education to be made complementary to the needs of the country. Student should be developed as a skilled force for the development of the country. Arrange training for youths on different skills. Establishing cottage, small and large industries in the rural areas to encourage repatriation and stop further migration to cities. Arrange distribution of newly raised islands in the south of the country and create administrative, medical and communication facilities to encourage poor people for settling there. Fix a minimum interest rate for all micro lending by NGOs and save the poor from suppression. Banks to provide loans with easer terms. Stop middlemen’s interference and illegal profit. Conduct unbiased survey of all types of mineral resources. Develop own exploration organizations and avoid dependence on foreigners. Ensure access of all citizens to gas and solar power in order to reduce deforestation. All vehicles to be converted to CNG system. Preserve the gas and oil resources for future generations. Educate own researchers and scientists at home and abroad on space technology. Establish a research center for conducting research and development. Undertake plan to possess own satellite. Widen the roads throughout the country. Ensure fitness of all transports ply on road. Ban unfit vehicles. Authorize scientific designs for body construction of different types of vehicles. Convert all motor engines into CNG system. Introduce traffic system in educational curriculum. Ensure modern driving training and licensing system. Facilitate extension of Dhaka City. Shift max Govt. offices, from center of cities. Construction of new super markets and high raised buildings beside narrow roads to be restricted. Establishment of new industry within the city to be restricted. Hawker stalls to be removed from roadside. Develop modern residential areas and markets at outskirts of the city to encourage shifting of people and reduce pressure on existing unplanned city. Providing modern agricultural technologies to our farmers. Proving agricultural loans to farmers at easier terms. Ensuring water reservation by digging canals, ponds, excavating rivers, constructing embankments and ensuring due water share from India. Ensuring pesticides and fertilizer at affordable prices to farmers. Arrange cultivation of huge newly raised islands. Arrange agricultural education packages for farmers to raise their production skills. Ensuring high productive seeds in time. Establishing agricultural institutions in all districts. Restricting food stacking and ensure adequate supply. Encourage Foreign Direct Investments (FDI) and facilitate establishment of EPZs. Increase production and value adding capability to meet internal and export-target requirement. Increase diplomatic and trade relation with developed and ASEAN countries. Put ban on import of goods which can be produced within own country like food grains, fish, clothes, cycle parts, pens, office stationeries etc. Ensure effective border checking for smuggled goods. Patronize establishment of various industries within own country and enrich own export basket. Raise patriotism by media for use of own products. Increase export to ASEAN and Islamic Economic Zones. Lack of Foreign Direct Investment (FDI). Bangladesh needs to encourage the world nations and international financing organizations to invest more in social, economic and infrastructural development of the country. Political stability, improved law and order situation and managerial efficiency is required for attracting and proper utilization of FDI which needs to be ensured by the Govt. Establish a ‘Research and Development Organization’ for all kinds of technological research and development. Establish industries for producing transportation equipments like-Motor Cycle, CNG Taxi, car, Van etc. Produce all agricultural machineries like power pump, trailer, tractor etc within own country. Be self reliant in producing certain categories of arms and ammunitions within own country as Bangladesh may be cut off from rest of the world in times of any invasion by potential neighbour. Emphasis on introducing technology oriented education in all educational institutions. Prepare a water management plan for the country. Ensure preservation of water by digging ponds and canals and building embankment around haors/bills of Sylhet and Rajshahi etc. Dazing of rivers for maintaining water transportation. Develop and maintain diplomatic relation with ASEAN countries. Establish road communication with Myanmar and then with China and Thailand. Encourage tourism to and from these countries. Study needs of those countries and e encourage our entrepreneurs and exporters to increase trade with those countries. Build Karnophuli Bridge over River Karnophuli immediately to facilitate export –import with those countries. Arrange to create required numbers of IT instructors to meet countrywide demand. Arrange distribution of required number of computers in every school, college, Madrasa and university. Arrange purchase of computer by every student with long-term credit. Ensure production of adequate units of current. Ensure supply of current and solar power in all rural areas. Arrange higher education on specialized subjects of IT. Arrange employment of IT specialists at home and abroad. Promote development and export of Software. Introduce technical education in educational institutions. Arrange skillful training for employed and unemployed youths. Provide adequate study loan on long-term basis. Assist for employment in international job market. Dependency on Primitive Technology in Agriculture, Transportation and Industrial Sector. Provide modern equipments for agriculture along with its training. Develop roads throughout the country and introduce modern transportation along with training. Introduce modern technology in industrial sector to improve production level. Arrange training on different technologies to develop skilled manpower to operate modern machines. Arrange gradual release of water through Farakka Barrage by India. Digging of canals, dredging of river beds to increase river’s water containing capacity. Arrange early warning for people. Introduce floating seed fields and vegetable fields. Arrange adequate measures for protection of fisheries so that fishery projects are not overflowed by flood. Preserve adequate amount of medicine and relief materials stacked for distribution with immediate effect. A National Disaster Management Policy should be undertaken taking Govt and opposition parties’ representatives. International communities to be involved in surveying the effect, estimate the damage and providing assistance for rehabilitation. Undertake a national policy to manage the disaster. Ensure abidance of engineering design for construction of buildings. Ban present system of gas supply for household use by pipeline as this gas line will cause fire and burning of lives and properties. Govt. should introduce cylinder compulsorily for house-hold purpose. The electricity supply line also should be made under surface to avoid people’s death by electrification. A reserve of emergency food and medicine should be maintained to manage big level crisis. The major issues for sustainable development in socio, economic and environmental sectors have been identified and some suggested measures put forward for policy formulation. Our approach to these issues needs to be undertaken based on national interest and NOT political party-biased interest. Though the approach may be different from government to government; but all these issues need to be taken under consideration to find feasible solutions. Bangladesh should establish a positive image by highlighting its reform and opening up, the growth of the media, cable television, the rapid expansion of the cellular phone network (the subscriber base should cross 50 million by the end of the year), and technological improvements and reforms in the communications and the ICT sectors. Developments in the ship building, pharmaceutical, textile and RMG sectors also need to be projected. It is also important to communicate widely the on-going initiatives to combat corruption, install regulatory reforms and make improvements in the business climate in the country. Bangladesh must continue the strategy of emphasizing trade over aid; it should also take advantage of the foreign investment funds flowing into its dynamic regional neighbors, India, Vietnam, and China. It is important to build bridges with the Non-Resident Bangladeshi (NRB) population. NRBs can contribute most significantly to the national economy of Bangladesh, especially in terms of investments. Thus Bangladesh should promote investment facilities for the NRBs. These investments can help increase the foreign reserves of the country, as well as promote its gross productivity. It is highly likely that if the policies are convenient to NRBs, they will be keener to invest in Bangladesh. Moreover, the diaspora population could potentially allow access to the global economic and financial chain, as they may have linkages with foreign trade channels. Bangladesh must continue the easy money policy until there are clear signs the economic trends have turned positive. Policy makers must also provide a large fiscal stimulus to modernize the nation’s infrastructure and protect the economy from the global economic slowdown. To sustain development and gain political support for fundamental reforms, citizens residing in different parts of the country should all experience an improved living standards and quality of life. Since food and energy prices have come down substantially in world markets, the overall inflationary pressures should remain in check in the foreseeable future. The public must be apprised of the global price scenario through media releases. Bangladesh should try to promote public diplomacy; that is, to promote interaction among the people of both the countries. Among the most noteworthy achievements of Bangladeshi diplomacy has been the creation of SAARC. As such, our diplomacy should continue focusing on strengthening SAARC as a platform for peace and prosperity in the region. Regional cooperation in the energy sector has become vital for maintaining security and development in the region. A comprehensive and integrated trade facilitation framework needs to be adopted in our foreign policy incorporating: promoting integrated transport infrastructure including transit and transshipment of goods; facilitating and promoting development and modernization of Chittagong and Mongla sea ports as regional hubs; pursuing economic diplomacy to remove non-tariff barriers in trade between Bangladesh, India, Pakistan, Nepal, Bhutan, and SriLanka; promoting regional customs cooperation; and promoting regional energy cooperation. Bangladesh should also pursue market access in different parts of the world. Through economic diplomacy, Bangladesh. Should develop and maintain close linkages with the OIC, ASEAN, EU, and the Commonwealth. In order to achieve a prosperous and progressive society, a clear policy statement must emanate from the government that addresses the most fundamental concerns: (i) human rights (ii) democratic values and practices, (iii) governance and (iv) rule of law. No nation can progress without satisfactorily addressing these fundamentals. The Constitution of Bangladesh stipulates that all power of Bangladesh belong to its people. We recommend its full implementation in letter, spirit and practice and urge the elected public representatives to remain pledge-bound to this sacred trust. It is particularly important for the new government to make a clear statement about Bangladesh’s stance on its secular values. At the very least, it must emphasize and reiterate its tolerance and respect for “all” faiths and creeds, giving them the assurance that, as citizens, their legitimate rights will have equal protection. The people of Bangladesh have also been historically deprived of democratic values and practices that have been replaced by despotic and dictatorial regimes. Re-establishment of democratic values must become a priority of the present government: from the party, to the community, to the national level. The contributions of the military, however, need to be recognized. They have demonstrated in the past that they are often better at bringing stability to unstable situations. The recent and successful voter drive by the military is also noteworthy. Political leaders, bureaucrats and the military must work together so that their unique strengths are not frittered away in tensions and conflict. The rule of law has to be established immediately. To plan the transition to a modern economy, policy makers must create a 21st century regulatory framework. Crime and corruption must be brought to an end. Reforms must be undertaken to increase transparency in government policy-making, raise public awareness, establish independence of the anti-corruption bureau, strengthen the independence of the judiciary, and build up the civil society. The party in power and the opposition must each set the tone for bipartisanship and respect for the civil society. Finally, appropriate steps must be taken so that the elections and transition of power occur smoothly every five years. Each year approximately two million additional workers enter the labor force looking for jobs. Even if the population growth rate declines dramatically, large annual additions to the labor force will continue for some years given the dynamic effects of demographic transition. The new administration will be responsible for creating roughly 10 million new jobs during its five years in office. The minority communities, including women, must have the same opportunities in the government’s efforts to create jobs. The collapse in crude oil prices and the abrupt end to the real estate bubble in the oil-producing Middle-East may result in the return of many Bangladeshi workers. As the share of the farm sector in the economy continues to decline, the industrial and service sector must be able to create millions of new jobs to absorb the influx of farm labor. In this backdrop, we recommend that the new government take a number of steps to boost employment. The administration should create jobs for Bangladeshis by facilitating increased flow of remittances that work their way into creating jobs in the economy. Second, a sophisticated and sustained effort must be launched to substantially increase foreign direct investment in Bangladesh. There is no reason why Bangladesh cannot compete with its Asian neighbors like Vietnam, which have attracted a large pool of global investment, thereby creating millions of jobs. Bangladesh must be seen as an attractive destination for global investors. In sum, global investors must be made to feel welcome. The new government should build on the demonstrated record and potential of micro-finance and other non-traditional strategies popularized by the Grameen Bank, BRAC and other globally recognized NGOs to create small- and medium-scale entrepreneurs, who are self-employed and who can create new jobs in the local economy. A massive investment program strategically implemented to build the national infrastructure for the traditional and the new economy will create millions of new jobs directly, as well as through the multiplier effect. As long as millions of Bangladeshi citizens live on the margin of starvation, any natural disaster or price spike in the international food markets can create a painful food crisis. The recent food crisis (2007–08) was partially caused by disruptive price bubbles in the world rice and grain markets. Self-sufficiency in food production is an important challenge, and a stated goal by the major political parties. We welcome this commitment, particularly in light of the high levels of inflation during 2007–08 that devastated the purchasing power of many ordinary citizens in Bangladesh. The recent reductions in fertilizer and diesel prices reflect the government’s concerns about food security. This will bring welcome relief for farmers producing the next boro crop. The recent collapse in the price of crude oil should help maintain the lower price of fertilizer and diesel, two very important ingredients for farmers. The extent of price reductions must, however, account for cross-border informal transactions (smuggling) that could run counter to the goal of benefiting the farmers from such measures. Food security also has more to do with real incomes (buying power) than the available stock of food. The battle for poverty alleviation is thus the struggle for increasing real incomes for all Bangladeshi citizens. Second, major investments in the agricultural and food market infrastructure — roads, waterways, railways, storage facilities, dredging the rivers and embankments for flood control, etc. — will help the farmers increase production and income, while creating jobs, and help the country reach food self-sufficiency. Bangladeshi farmers must also benefit from the ready availability of credit to invest in modern farm machineries, the availability of flood insurance and futures markets to reduce risks, and from having greater access to market information via the mobile phone and the Internet. We recommend that the new administration take up the challenge of laying the foundations of a 21st century infrastructure as a top priority. Bangladesh’s physical infrastructure is in serious disrepair and has lagged behind compared to its needs. Thus, patients die on their way to hospitals in the rural areas for lack of decent roads and transportation modes. Food supplies do not move readily from one area to another to match demand and supply, causing temporary price spikes. And the clogged streets in the cities that delay deliveries of key shipments (especially garments) increase the uncertainty and cost of doing business and encumber competitiveness. A bold and ambitious strategy of investment to build the country’s infrastructure will achieve multiple outcomes: generate immediate employment and income to reduce poverty, reverse the impact of the ongoing global economic slowdown, support ready-made garment (RMG) and other export industries, and ultimately create conditions for sustained economic progress. In the face of a severe global economic slowdown, the time is right to take up this project. Massive and strategically planned investments in physical and digital infrastructure can help Bangladesh leapfrog other nations, and at the same time work as a stimulus package to create jobs necessary to confront the vagaries of global recession. These mega projects should be undertaken with a firm commitment..
Energy is a prime mover of the national economy. With vibrant sectors such as ready-made garments, pharmaceuticals, shipbuilding, agro-industries, ceramics, raw hides and leather goods, jute, tea, and related products, as well as the service industries, that earn huge foreign exchange and are reliant on consistent supplies of energy, the government must have a viable energy policy that will address short and long term energy needs for the country’s operation and development. As capacity is gradually increased, how that capacity will be allocated also needs to be projected for a stable and sustainable growth model of the economy. It may also be noted that roughly 30% of the population presently has access to power supplies. With the present output of roughly 5,000 MW of electricity, effective power generation by the PDB is about 3900 MW while private power suppliers produce about 1200 MW. With a burgeoning population and the need to extend power to a larger segment of the population, power generation capacity must be increased substantially. We project that a 100% increase in power generation would be immediately absorbed. Reliance on natural gas to generate power must be weighed against alternate sources. Reliance on imported oil is not a solution for Bangladesh and hard earned remittances and export dollars should not be spent on unplanned energy expenditure as oil prices raise. Relying on domestic energy will also lower the rate of inflation, the current account deficit, and the continued devaluation of the taka. Energy efficient transportation systems, alternative energy development and use for power and industrialization needs will allow the country to continue its low carbon imprint. Local entrepreneurs should be encouraged to invest in small power plants and renewable energy technologies to increase and diversify the production capacity of the national grid. The education system of Bangladesh must be designed afresh. Foremost is the need for a comprehensive and fresh education policy that envisages the specific needs of Bangladesh for the present, as well as for the future. The government must envision a ground-up new education system that integrates the various, unrelated and incoherent streams of education that exist today. The government must be able to clearly state what entities are to be produced by the education system and to what purpose. We reiterate that it is imperative for such system to consider the needs of Bangladesh now and for the next few decades. The new administration must find resources to invest in education at all levels, aligning this part with the needs of building, supporting and sustaining the nation’s infrastructure, industries, and service sectors. The 21st century global economy will increasingly demand knowledge workers. To this end, the government must offer more technical and vocational training opportunities to build people with technical skills — basic machining, operating, repair, computer operations, etc. — with a basic 10th grade education. The government needs to promote and establish programs to train people for retail, transportation, education, and other service sector jobs, since these are the primary areas of employment. By expanding literacy to 100% of the population and ensuring that an increasing number of young people have opportunities for higher education, the nation can succeed in alleviating poverty and achieve other ambitious goals. Another alarming problem is the current capacity of the education system in Bangladesh to accommodate the growing number of willing and capable students. In 2005, out of approximately 73 million students of different age-groups, only 25 million had any education (90% at primary, 44% at secondary, 10% at intermediate college and 1.6% at university levels). During this year, the number of educational institutions was approx: 80,397 (primary), 18,500 (secondary and higher secondary), 3,150 (intermediate, colleges) and 74 (universities). By 2025, the population will grow to a staggering 192.9 million, of which nearly 83 million people, an increase of nearly 10 million additional students, will be of school age. At the current rate of attendance, the nation will have to increase capacity by 15%, will have to build almost 15,318 additional educational institutions. And, if the demand for education goes up (which is expected to happen), even by adding 100% to capacity, the system will be under tremendous pressure for space, especially at the higher education levels. Health and human productivity are intertwined. There is a bi-directional relationship between health and economic development. The positive externalities of keeping a nation’s human resources healthy also cannot be emphasized enough. From a policy perspective, the government must be able to envision the desired state of health of the nation reflected in nutrition, water quality, air quality, economic status, mental health, physical health, reduced state of disabilities, etc. What is vitally important is to articulate a pro-poor health strategy where accountability, quality, cost effectiveness, access, and sustainability must be ensured, all focusing on the need for more effective and efficient health programs. The focus on preventive rather than curative health care must be strengthened. The National Health Accounts study (NHA-2, 2003) estimates household expenditures at Tk. 48.35 billion on health related expenses of which pharmaceutical purchases constitute around 70%, while expenditures on qualified medical providers is only 4.1%. This represents a problem in that the ability to purchase drugs freely can be downright harmful. Legislation must address this problem so that drugs are not available without qualified prescriptions. We also advocate periodic certification of healthcare providers (doctors and nurses in particular) to ensure that the people receive a basic standard of services. In addition, we feel many trained doctors end up in administrative work far removed from the direct provision of health services. We advocate the establishment of health administration training so that a different cadre of health administrators is created for those who want to be administrators. Bangladesh is the 7th largest nation in the world. Estimates are that there are now about 150 million people that is expected to grow to 250 million before it stabilizes. This can be seen as strength if managed properly. Thus, population management (not control) should be given major attention to harness this strength effectively, both for the local economy as well for earning from abroad. It is easy to surmise the tremendous opportunities that await a skilled workforce to fill the population bust, thereby sending remittances back to Bangladesh that could be multiples of the present $6.4 billion. The under-15 population is also roughly 40% of the total population, resulting in the “population momentum” phenomenon driven by the young age-structure of the population. When it comes of age, its needs must be met, not only in education and health, but in employment and various service needs. Bangladesh started its journey from 1971. But it doesn’t get its targeted development on economy and other social sectors. Bangladesh is a democratic country but it doesn’t enjoying its advantages of democracy. Bangladesh has a great potentiality of development in economy and social sector. Bangladesh is in a sweet geographic from where a country can enjoy the potentiality of development. Bangladesh is an agrarian country in south eastern area of Asia. Its economy largely depends on agro based sector but now the trends are changing and economy is mainly depending on garments industry. Bangladesh receives a huge amount of export earnings from garments industry. Even though Bangladesh is not prospering due to some disorders on distribution of wealth. There are huge corruptions on economy; population is also a great problem economical development. Bangladesh has a vast population rather than its geographical area. So that Bangladesh economy is not progressing. Even though, Bangladesh can gain sustainable development through some policy and with some attainable goals. Bangladesh govt. has taken some initiative to boost its economy. Bangladesh has to follow international development policy to boom its economy. Population control is one of the major challenges for Bangladesh to attain its economical vision; corruption is another challenge for Bangladesh. Illiteracy is another problem for Bangladesh and has to overcome it as soon as possible. Bangladesh has to look after more on industrial sector for getting sustainable development. 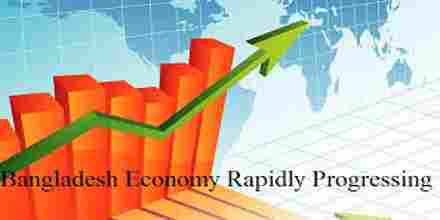 Target for Bangladesh should to attain GDP rate in double digit. By following those policy and recommendation Bangladesh can boost its economy.